Grab a seat by the stunning pool. Let those theme park aches melt away. It's a great place for a refreshing cocktail. Pick up drinks, snacks, and tickets for a long day of fun. Spacious residences are adorned in elegant tiling. Take a stroll along the lakeside path. Get free shuttle service to Disney World. Enjoy a drink at Poolside Tiki Bar. Enjoy the beautiful views from your private balcony. Unwind with a relaxing soak in the jetted tub (in all condos). 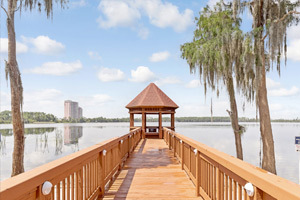 The Mediterranean-Inspired Lakeside WorldQuest Resort Orlando is conveniently located near the best theme parks in Orlando. After dropping off your luggage in your condo, get changed into swimsuits, grab pool toys and water wings, apply sunscreen and get ready to be amazed. The gorgeous pool area is adorned with elegant tiles and Italian cypress trees. The massive outdoor heated pool is more than you could ever hope for. Head to the poolside Tiki Bar for a delicious cocktail. Pull up a lounge chair and get comfortable – you’re going to be here for a while. Feel like a workout? Get your cardio on at the fitness center, located in the clubhouse. After a long day at the Orlando theme parks, there’s nothing like relaxing in the hot tub and letting the aches of the day dissolve. Spacious two- to three-bedroom condos sleep four to six guests. Upgrade to a superior condo for tile floors. Full kitchens with granite countertops have everything you need to make everyone’s favorites. Visit the on-site 24-hour food market or the nearby Walmart Supercenter to stock your kitchen. The kids will be begging to help bake your famous chocolate-chip cookies (and be the official taste testers). And freezers are perfect for storing dessert – fudgsicles for the kids (and a Ben & Jerry’s stash for the grown-ups). Did the kids end up with chocolate on their clothes? No problem; you have an in-suite washer/dryer. While the laundry is going, catch a sitcom rerun on the Flatscreen TV, it has Cable. DVD players are perfect for a low-key night in for family movie night. Bring favorite movies from home, pop some popcorn and call everyone into the living room. Last one on the couch is a rotten egg! Once the kids have fallen asleep, enjoy a relaxing soak in the jetted tub. You’ve earned it. WorldQuest Resort offers a free shuttle to Walt Disney World®. There are four main lands at Walt Disney World®: Magic Kingdom®, Epcot®, Hollywood Studios® and Animal Kingdom®. Looking for the classic attractions? Pirates of the Caribbean®, It’s a Small World®, Jungle Cruise® and many more can be found at Magic Kingdom® along with New Fantasyland®. Experience the culture and food of eleven countries in The World Showcase® at Epcot®. Ride through Arendelle with Elsa, Anna, Olaf & Sven at Frozen Ever After® or ride Ellen’s Energy Adventure®. ®, Toy Story Mania® and the Rock’n’Rollercoaster starring Aerosmith are at Hollywood Studios®. Animal Kingdom® is where you’ll find Pandora - The World of Avatar®. Glide through caves past rainforest creatures and glowing plants on the Na’vi River Journey. Go for a 3D ride on the back of a mountain banshee on Avatar Flight of Passage. SeaWorld® has several shows, rides and animal experiences. The shows include dolphins, sea lions, dogs and cats and even doves. Kid’s will love riding Shamu’s Happy Harbor, the kid-friendly rollercoaster. Tackle Orlando’s tallest, fastest and longest rollercoaster – Mako. Get up-close and personal with a dolphin or check out the five species of penguins in the Antarctica: Empire of the Penguin (Habitat). Universal Orlando® allows you to ride the movies. Universal Studios® has rides that feature E.T., the minions of Despicable Me, Shrek and the Transformers. Universal’s Islands of Adventures rides have the dinosaurs of Jurassic Park, Spider-Man and The Incredible Hulk. The Wizarding World® of Harry Potter is located over both parks; you will need a park-to-park ticket to see it all. Be sure to take a ride on the Hogwarts Express. Extra-person charges may apply and vary depending on resort policy. Note: Universal and Seaworld shuttle require a reservation. Shuttle times are subject to change due to traffic and weather conditions and may occasionally run 15-20 minutes late. Proximity to I-4 makes it easy to access every theme park. Tip: Shopaholics must visit Vineland Premium Outlets. Distance: 18 miles to airport. 2 miles to Disney.